After rereading an email from Catherine AND talking at length with another Belgian native, I think I better understand how St. Nicholas Day is celebrated (at least in Belgium.) After my bit of sleuthing it is clear that European holiday traditions differ greatly from country to country. Since I've yet to meet and interrogate a Luxembourger on the rituals of St. Nicholas Day, I'm going with the Belgian version. Besides, it's charming. 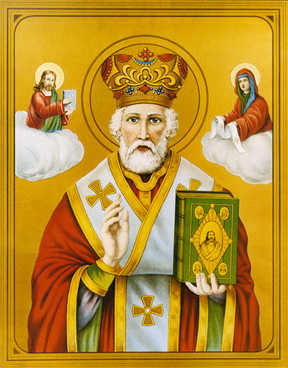 The celebration of St. Nicholas Day begins a week or so before December 6th. Each night children leave out their shoe, preferably near the fireplace for St. Nicholas to find. In the morning they find a small sweet, like a chocolate coin, hidden in their shoe. This continues until the night of December 5th. On that evening children leave milk & cookies for St. Nicholas and something for his donkey (like a carrot) to thank him for the treats. On the 6th children wake to find another sweet in their shoe, a plate with oranges, nuts, chocolates and speculoos (traditional cookie) on it and a gift (varies between families.) Some Belgian families additionally celebrate Christmas. What a cool tradition, huh! I just love learning this kind of stuff. It's so interesting to me. So, we kinda blew it for this year. The girls won't know, though. They'll be excited enough with the 5th and 6th. 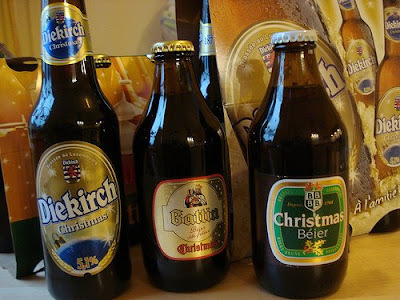 We have been sampling the Luxembourg domestic Christmas beers. As I purchase them, I often wonder if it's similar to buying a Rainier Christmas beer or an Olympia Christmas beer. Not sure about the beer hierarchy here. I'm looking forward to doing the research. Saw this house in our neighborhood and thought it was such a clever decorating idea. 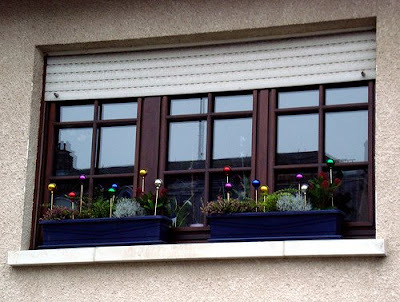 Looks like they took Christmas ball ornaments, put wooden dowels in the them and then poked 'em into their garden boxes. I thought it would be pretty to pile fresh greens or holly branches on the garden boxes and then have the Christmas balls poking out. What do you think? I love the Christmas balls. I think may do that in our little garden out front. I put Christmas balls in my garden (well pre-Logan I did!). I just stick the end in the dirt and voila! I also put them hook side down on top of votive holders.